I'm so excited to share my first project for Doodlebug Design. I have a fun 3d igloo. I often find inspiration for my project in the collection I'm working with. As soon as I saw the Polar Pals Collection, I knew I wanted to make something with an igloo. I quick look in the Silhouette Store turned up this fun box. It has a very shallow bottom that could be used for a few pieces of candy but I think it's cute as a centerpiece or table decor. I added some stickers from the collection to create a fun little scene. I'm in love with that adorable little husky! 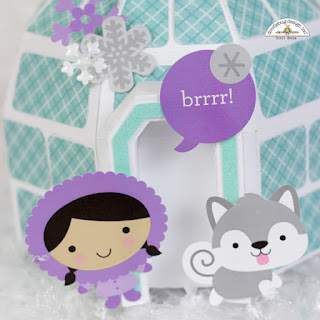 I finished off my igloo with a Boutique Button and some lilac Doodle Twine. I can't wait to create more with this adorable collection.